The following metholodology is based on my personal experience with textile reconstruction with the living-history group “la Fara”, my experience of teaching at the Siena University Summer School, and la Fara’s cooperation with Museo Archeologico Nazionale in Cividale del Friuli, whose support was fundamental for some of the described reconstruction steps. This method can be applied in other contexts, but it is not, obviously, the only possible one. Moreover, new data, new studies, and new necessities strongly influence its development. The described methodological approach answers the specific, living-history related need to produce garments fulfilling certain conditions. We aim to create a plausible reconstruction, consistent with the data in our possession, and able to visually convey didactically useful information. We often underestimate the value of information given at a glance by the combination of clothing, posture and accessories, and the ability of the beholder (even if they are not “educated”) to memorize the information gathered in that single glance. It is then every re-constructor’s responsibility to avoid inventive solutions and shortcuts, to be influenced by his or her personal taste and to be aware of the distance wrongly given or received information can cover in a relatively short time. While considering the procedure’s complexity, we must take into account the lack of intact finds and sources and the resulting necessity to date these items, connecting information in our reach in order to build a plausible image. While doing this, it becomes vital to comply with a series of “good practices”: beneficial behaviours for an appropriate approach to scientific reconstruction, while avoiding shallow or simplistic solutions. In my opinion, a key approach is to stick to what can be considered as a plausible choice, endorsing solutions able to satisfy common and everyday needs instead of reconstructing a specific, exceptional find. Unless your goal is to reproduce a specific item for a specific context, the aim of didactical reconstruction is, in fact, to represent an “average”, to give a perception of what was common in a given moment in time and geographical location. For the same reason, it is important to avoid depriving a find of its exceptional nature by producing a large number of copies of said item, “flooding the market” with objects whose uniqueness will therefore be lost. In addition, source handling becomes of the utmost importance. It is proper to be careful, establishing a possible chronological and geographical “range”, keeping it as consistent as possible with the reference background. Once a satisfying amount of information is gathered, it is important to “tune in” with the right mental approach towards materials and production, focusing on the suitability of practical and technical choices and on the need of treating the materials as precious goods, avoiding waste and being respectful in order to learn as much as possible from the practical reconstruction process. Moreover, we need our approach to be incisive and above all consistent in terms of time, geographical and cultural context, social class and so on. For example, no one, not even nowadays, would wear formal garments while doing heavy chores. 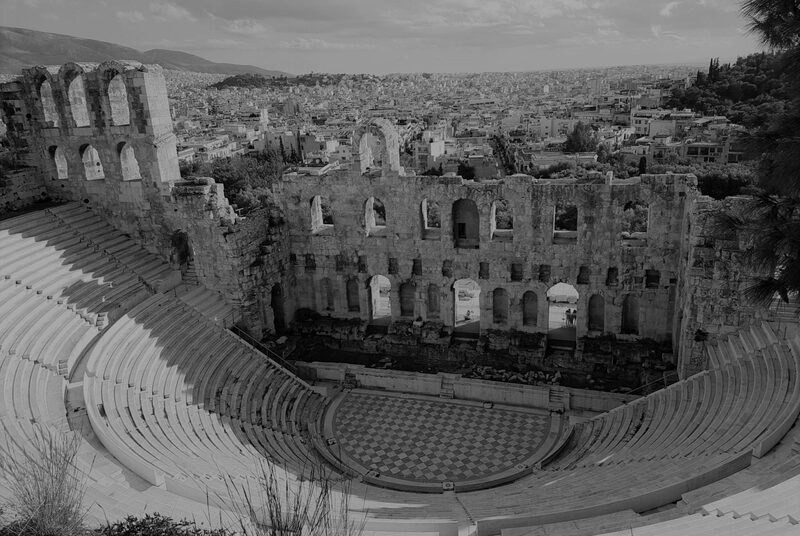 We also need to keep in mind the always existing connection between fashion, economy, and historical and social contexts. An historical garment must be thought of and treated the same way we treat our everyday clothes, and must respond to the same need of comfort, movement range, durability, and so on. While testing a reconstructed kit, we must be able to perform every activity an individual from the represented status would have performed without the garment tearing apart or being a nuisance. As re-constructors we are forced to ask specific questions about clothing in our reconstructed time, and it is our duty to find answers to those questions without setting aside an element we find uncomfortable to wear. Every reconstruction hypothesis needs then to be tested “in the field”, to identify conceptual and structural faults that will be corrected in the following versions in order to keep getting closer to the originals. The one experience that, more than others, allowed me to test the approach described above is the reconstruction of the tunic from grave 40, Railway Burial Site. The starting points of this research are represented by the study of the finds, written sources, and iconography, and the comparison with extant findings consistent in time and space with the one I was going to reproduce (img. 1). The burial has been dated to around the mid-seventh century. 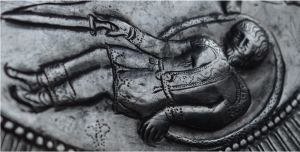 It contained a remarkable 23 inlay decorated belt elements surrounding the male human’s hips. The materials the belt is made of, the number of its pieces, and their position around the body allow us to gather a series of information about the possible proportions of the garments and its materials and to hypothesize the presence of multiple textile layers around the body. A closer examination of the belt-hanging piece 14-b (img. 2) can give us the following data. The piece shows multiple stratification of organic material (fabric), mineralized on the interior side of the plate, the one facing the body. The position of the textile suggest its being related to a garment worn under the belt, allowing us to rule out a mantle or a shroud. Further observation made us notice a diamond shaped pattern on the mineralized surface, pointing us towards a class of textiles widely used in the early middle ages: diamond twill (img. 3). 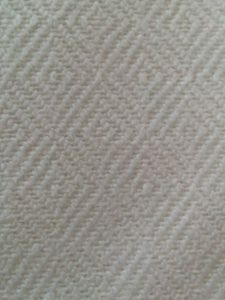 Diamond Twill is a variation of “twill”, a weaving pattern featuring relieved diagonal lines in a wide range of variations that can change based on time, area and social status. It is still one of the preferred ways to weave wool. Other versions of twill weave are known in the Germanic area during the early middle ages. Among them I could mention: herringbone twill, rautenkoeper, rib twill (group of variations showing weave-like patterns), rose twill, spitzkaro (“goose eye”), rippenkoeper and more variations of the aforementioned diamond twill. Although at the moment an in-depth analysis of the mineralized material is not available, the presence of twill weave and the thread thickness allows us to hypothesize it might have been wool. The position taken by warp and weft threads in the weave, in fact, brings some threads (always the same ones) up, allowing them to be frictioned and fulled and therefore enhancing the overall insulating power of the garment, making it ideal to be worn over another layer of clothing. 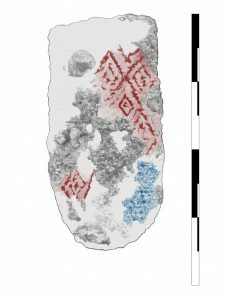 Further visual analysis of the find shows another layer of mineralized material on the bottom right of the plate, yellower in color than the twill (pictured in blue) on which a much finer tabby weave pattern is quite visible. The difference in weave and thickness suggests it belongs to another clothing layer, worn underneath the twill and possibly in contact with the body. 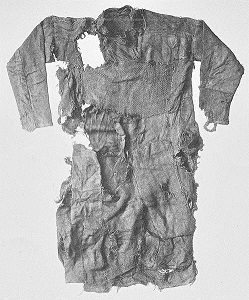 The refined weave, the thread diameter and the tightness of the fabric suggests that it might have been a linen tunic, used as an undergarment. Other factors support the idea of this second garment having been made out of linen. 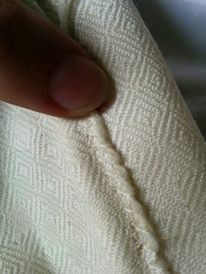 The first is the relatively scarce resistance to friction that makes linen fray easily when rubbed for a long time. When using tabby weave instead of twill the friction is better distributed on the surface, allowing the garment to last longer. Another factor that has to be considered is the insulating abilities of the linen–wool combination, whose employment is widely documented throughout history and allows the wearer to maintain a relative comfort regardless of the weather due to the water absorbing capacity of linen and the insulating ability of wool. This combination has been tested for years by la Fara and we can personally assure the reader that the overlaying of the two garments is comfortable even during the summer, provided that both garments are worn first thing in the morning so the body can adapt. The feeling is, of course, different from the one you can get wearing a cotton t-shirt but not much less comfortable, all things considered. I also feel the need to emphasize that, even if in modern times wool is usually associated with cold weather and wintertime, the material itself can be worked into very thin and fine fabrics, such as the ones used for male formal clothing, that can be worn even during the summer. Historia Langobardrum by Paulus Diaconus offers a pretty specific description of Lombard costume: Vestimenta vero eis erant laxa, maxime linea, qualia Anglosaxones habere solent, ornata insitis latoribus vario colore contextis. What we gather from this description is that the garments were wide, often made out of linen and similar in style to the ones Anglo-Saxons used to wear. They were also ornate, with wide colorful bands, possibly woven into the tunic or in various colors. There are other elements of the Lombard costume that are mentioned in the book, such as their habit to wear white leg wraps (this apparently being a specific tribal custom), to wear their hair parted down the middle and to shave the back of their heads. As tempting as it is to take this source literally, we must not forget that Paulus lived during the eighth century and did not personally witness the events he wrote about. It is important to identify the basic criteria for choosing the most appropriate sources. We need sources close to the time, culture and geographical area we are willing to picture, keeping in mind the importance of cultural exchange and influence in the early middle ages. What I consider to be the closest visual source is the Isola Rizza plate, found near Verona. Its style, technique and choice of portrayed characters suggests it was made in the eastern areas of the Roman Empire. Visual analysis of the details suggests a date around the end of the Greek–Gothic war (mid-sixth century) and it can be safe to suppose that the two figures depicted on the plate are a Byzantine and what is safely defined as an “eastern German” (probably not a Lombard). 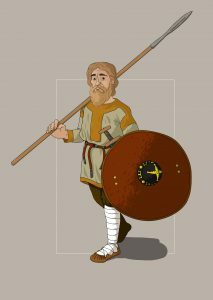 The Germanic warrior wears a tunic which is depicted in excellent detail and very close to the description Paulus would give two centuries later: it has long tight sleeves; it is wide and reaches almost down to the knee. It also has decorative woven bands with the distinctive “lozenge and dot” pattern which seems to have been widely disseminated throughout Europe (and the middle east) at the time. The woven bands’ position is peculiar and not meaningless, as we proved during the practical phase of the reconstruction. At this stage, though, it is enough to note the position of the bands on the shoulders and especially around the upper arm which will prove to be related to the structural integrity of the tunic as well as its aesthetics. Another interesting source can be identified in the Rodchis’ seal ring from the Lombard burial site of Trezzo sull’Adda, dated to the seventh century and showing the figure of a bearded man with his hair parted in the middle, the hand lifted in a blessing gesture and a tunic whose decorations match very closely the ones pictured on the Isola Rizza plate (img. 4). Other sources, as the Stilicho Stone (fifth century), the Tours Bible (sixth century, img. 5) and the later Stuttgarter Psalter (ninth century), picture tunics that are remarkably similar in structure and sometimes decoration to the one depicted in the Isola Rizza plate and so do mosaics from Tunisia and Israel, giving us a glimpse of the wide geographical distribution of that specific decoration style. When searching for more substantial finds, we still need to follow the aforementioned criteria of time, geography, technical development and culture relation although the scarcity of findings in continental Europe, due to the composition of the soil, forces us to search in a wider time span in order to be able to identify common patterns and solutions. The most famous example of intact tunic find is, probably, the Thorsberg tunic (img.6), dated to around the second century CE. It has a very simple pattern: a straight bust with a narrow neck opening and long, tight sleeves. 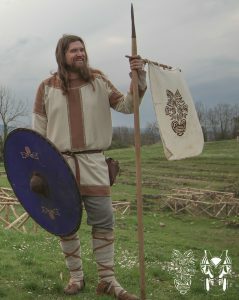 Another famous one is the Bernuthsfeld tunic (img. 7), whose exceptional features deserve a more in depth analysis than the one I am going to give for the strict purpose of this article. The tunic is made joining together 43 pieces of different fabrics but its shape is not different from the ones we already discussed about: it is wide and long, with long and relatively tight sleeves. Its features, along with the fact that it was worn without trousers, makes it somehow link-able to the ones pictured in the rural scenes of Tours Bible. 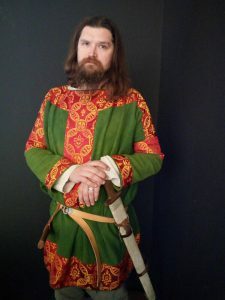 While trying to define the outline of an high status, seventh-century century Lombard tunic, we must not overlook the influence of Byzantine fashion on Germanic culture and, especially on those members of Lombard elite that might have had taken part in the Greek- Gothic war as Byzantine foederati. 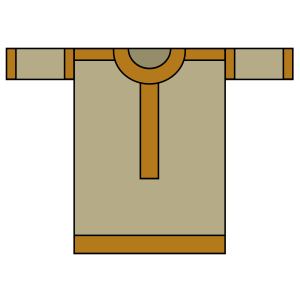 A brief look at extant Mediterranean tunics show that they tend to be extremely wide with short and tight sleeves beginning around the elbow and reaching down to the wrist. This shows an interesting shifting of the shoulder seam which moves away from the joint and down along the arm, allowing the sleeve to be tight without compromising movement range an structural integrity of the tunic itself. It also gives a possible explanation of the position of the woven bands on the Isola Rizza plate, making them both useful and decorative. This reconstruction hypothesis has been put to test during the following steps of the experiment. In order to begin the actual production of the tunic, we need to first define its features in detail. We are looking for a long and wide tunic, with a bust to sleeve ratio capable of showing some Byzantine influence, with applied decorative bands (img. 8). As mentioned while discussing the original find, the original fabric was (probably) a woolen diamond twill, its “diamonds” ranging from 1.2 cm to 1.5 cm in height. We managed to find a loom-state, undyed and unbleached fabric having almost the exact features of the original. The tunic was entirely hand sewn with wool thread and a bronze needle compatible with contemporary finds. The sewing techniques and stitches were chosen among the ones documented since the Iron Age: backstitch, overcast stitch and blanket stitch, plus a filler thread. I avoided basting, which might have implied a loss of time and a waste of thread, but kept the fabric in place using a total of four bronze pins. Both pins and needle tended to lose their sharpness, making the use of a sandstone essential for good progress. The underarm seam was moved down and placed roughly around the biceps. The tunic body is sewn with backstitch, leaving a seam allowance around 1 cm wide, which was then secured to the fabric of the body with overcast stitch while adding a filler tread to protect it from fraying. This technique allowed me to reduce to a minimum the fabric waste, avoiding the otherwise needed folding of the seam allowance (img. 9). As for the woven bands, I decided to use the same fabric of the tunic, and dye it with walnut husks. Dye choice was mostly related to our group’s resources, having foraged them in the group’s headquarters’ garden. It also allowed me to avoid mordanting the fabric which would have added one more rogue variable I was not comfortable with at the time of this experiment. The result was a deep, warm brown I was satisfied with. The brown bands were applied to the tunic where I expected the friction or seam tension to be more intense: around the neck, hems, wrists, shoulder and underarm seam placing them flat and sewing them with blanket stitch to avoid fabric bulks. To add more strength to the band seams, I overlayed them with a thin strip, handwoven with linen thread which also worked as an additional decorative element. The tunic proved to be a sturdy garment, capable of maintaining its structural integrity over a few years of performing everyday, living-history tasks and activities, while the dyed facings kept their brightness in spite of being repeatedly exposed to the sun. We are overall satisfied with the experiment’s results (img. 10). In 2017 we decided to rise the stakes and to make a richer version of the tunic, basing on newly achieved skills in dyeing and recently gathered information. For the new tunic, our target was to portray a higher status while keeping the structural characteristics that have proven to be solid during the previous experiment. We based the garments on the same burial, deeming it rich enough for the new version, picking a compatible diamond twill wool from a different seller since the original one was not available anymore. For the dye process we decided to go as far as my ability would take us and opted for a double dye with weld and woad in order to achieve a bright green. The dye process took therefore four steps: mordanting (done with alum), preparation of the weld dye bath (slowly cooking the weld stalks in hot water and then filtering it in order to obtain a clear, bright yellow dye bath), weld dye and then woad dye. For the facings we decided to search for an extant example of a period brocade showing the “lozange and dot” pattern so frequently represented in contemporary iconography. Thanks to the priceless help of Wulfheodenas’ member David Huggins (himself on a quest for a seventh century brocade pattern), we found an almost perfect candidate: the fabric of the St Madelbert Shrine in Liege (Belgium) (img. 11). 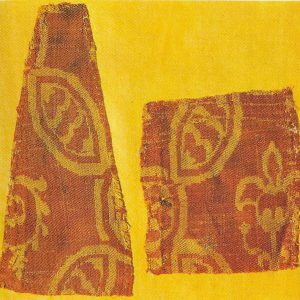 The fabric, woven in red and yellow, shows an intricate motif of leaves and flowers and, what is most important to us, the monogram of emperor Heraclius (610 – 640 AD) which places the fabric in the same time-frame of the burial. The result manages to convey, in my opinion, both the richness of early medieval Germanic textiles and the influence Byzantine fashion might have had on the upper classes in Lombard society. It represents to me a good starting point for further developments in my research in the field. In the end, one of the most important characteristics of reconstruction and experimental archaeology is their being describable as a “direction”, along which we move without the illusion of an existing destination. My wish and goal for the next part of this journey is to work closer with the National Archaeological Museum in Cividale del Friuli, with which we have an ongoing formal cooperation, to create a more comprehensive overview of Friulian Lombard textile findings. Thus, we will gather more valuable information to support further experimentation and to make more data available to scholars and fellow living historians (img. 12). This, of course, does not exclude the use of linen twill by people from a higher social status or in different climate conditions.